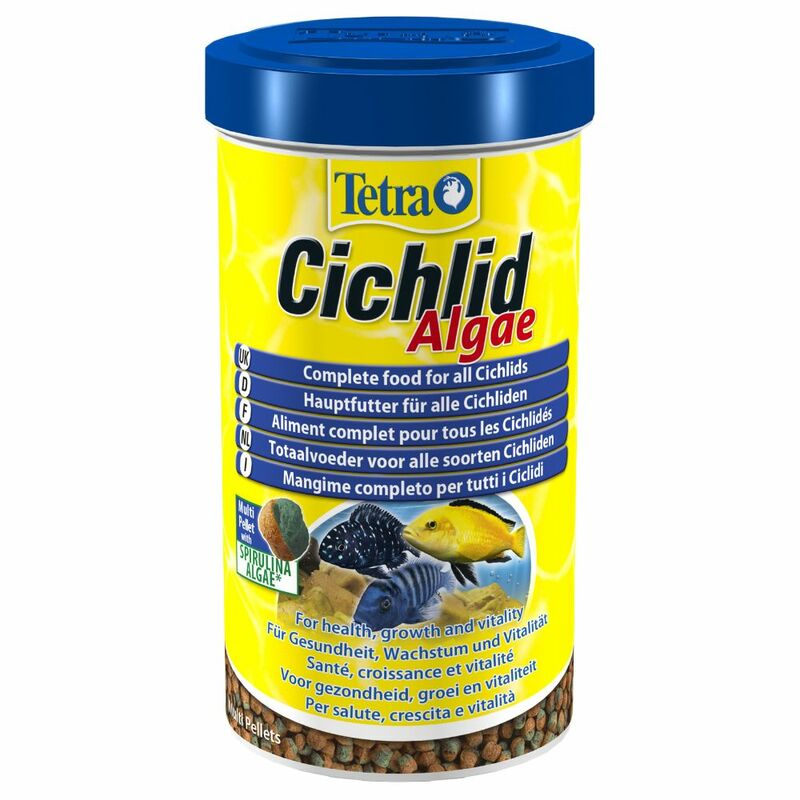 Tetra Cichlid Algae Pellets is ideally suited as a main food for all cichlids and is especially adapted to the needs of herbivorous species. This nutrient-rich pellet food contains spirulina algae, which enhances the colour of your fish and increases their vitality. Cichlids are extremely pretty ornamental fish, but depending on the species, can be quite tricky to care for. Water quality, plants and food need to be adapted to suit the needs of these special fish. With Tetra Cichlid Algae you can be sure that you are providing your cichlids with an optimal diet. The pellets are rich in protein (43% crude protein) and a mix of other nutrients ensure you fish have everything for their dietary needs. The added spirulina in the new multi-pellet formula increases the vitality of your fish and enhances their colouring. The balanced composition of nutrients in the BioActive formula helps promote health and growth in your cichlids. Tetra's Cichlid Algae Pellets are also ideally suited to the feeding habits of cichlids. These slow-sinking pellets are easier for fish to eat and thanks to the special Clean Water Formula your water will stay clear for longer as well! Tetra Cichlid Algae at a glance: Complete food for cichlids, especially herbivorous species Rich in high-quality protein and other nutrients New Multi-Pellet formula with spirulina algae for enhancing colour and increased vitality Beneficial towards your fish's health thanks to the BioActive formula Balanced composition Clean Water Formula keeps your water clean and clear of exceΒ food particles Easy dosage.